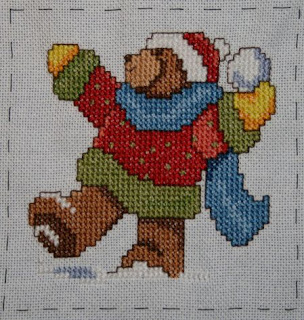 I stitched this little bear in a snowball fight on the hottest days of the year. It brought no cooling though. It is for Nadia, she chose winter as a theme for her RR. Next month the last one, I believe it is puppies then. 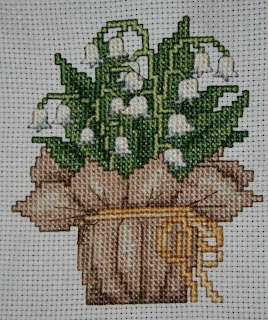 The Lily of the Valley square is for the Regenboogkussens. The theme was flowers for several cushioncovers for the families of the people who died as a remembrance. Next we will stitch cushioncovers for the wounded people. I will stitch a rainbow for one of them, not sure if I will have the time for more. DH was in the daycare center for palliative people yesterday. He was so happy, he was pampered all day, got a lovely bubble bath, a nice lunch and lovely companionship. He was full of stories when he came back home and slept like an angel. Next week he will go again. And I got some time for my own. I've decided to go back to quilting. I made some placemats in a long forgotten past, but still have a stash of fabric. See if I still got the skill for it and make something small in the near future. Since my last post, some BD cards have arrived with the BD girls of the Yahoo group. There was Brigitta who wanted celtic, art deco or butterflies. 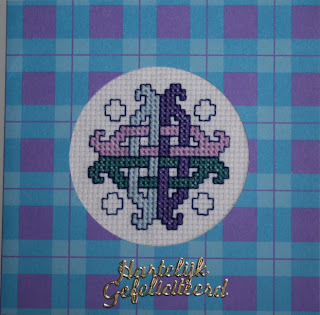 I stitched this celtic knot and put it in a tartan card. Greet wanted frogs, this colourful chap found its way to her place. 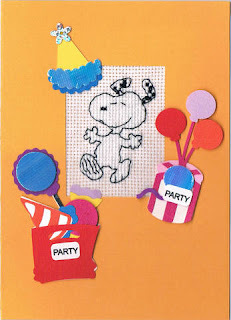 Wendy let us free choice, so I made Snoopy for her and you can see he's happy to celebrate. 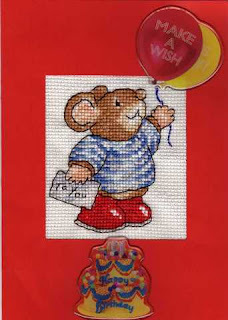 Winny loved mouses, so I stitched her Tom Mouse, my favourite Country Companions character. Margaret Sherry had another sketchbook design, the love bugs. 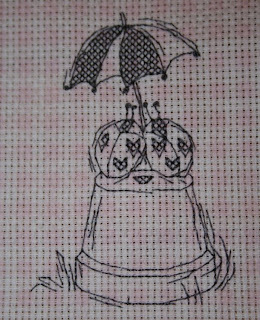 I stitched it on fabric with a pink touch. It's hanging on my easel next to the duck, don't really know what to make of them. maybe tuck pillows is a good idea. DH was in hospital for a few days to work on the paintherapy. He is doing very well now, morfine is given now epidural and he has a container for a week, no fuss 3 times a day with injections anymore. On Thursday his boss came over to fetch him for a tour around the factory labs where he worked. He was thrilled! The weather is hot here so we sit on our terras very much, it is a cool area with a touch of breeze, lovely! Ik ben een weduwe, mijn ventje is helaas te vroeg vertrokken. Ik woon in de buurt van Antwerpen, alhoewel ik Limburger ben, voel ik me hier volledig thuis. Ik sta ten dienste van mijn drie katten Lowie, Tommeke aka Macho en Hamish. Mijn hond Kwispel is eigenlijk een ongelukje, ik ben een cat-o-holic, maar toch een dierbare aanwinst in het huishouden. 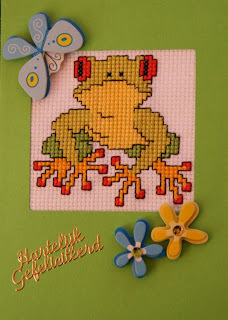 Ik ben de fiere mama van Heidi en nog fierdere Moeke van Stein, Robbe en Jelle, mijn prachtige kleinzonen. 8 1/2 months! Scary time flying!!!! So much to share-so little time!